Southern Peony: 2017 Peony Shop Holland 13 Intersectional Peonies Less than $20! 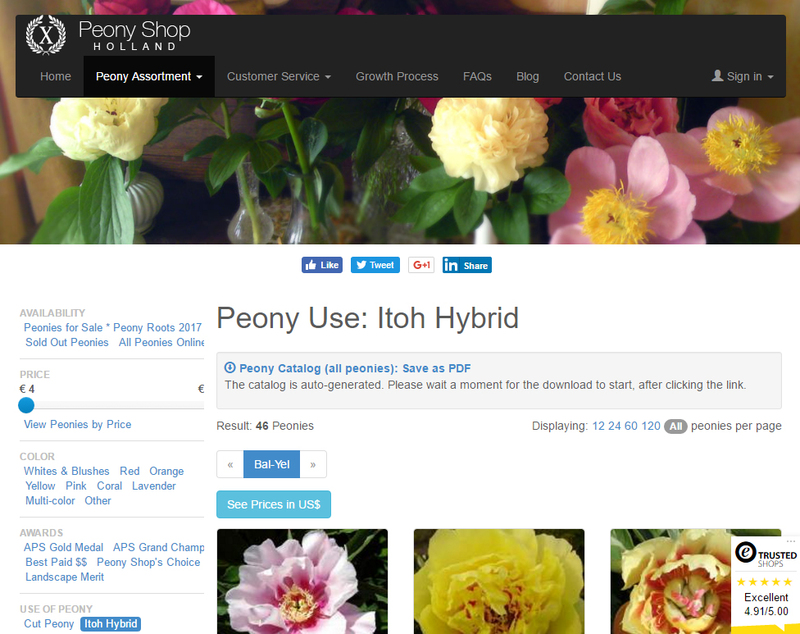 2017 Peony Shop Holland 13 Intersectional Peonies Less than $20! 12 Intersectional Peonies for Less than $20! 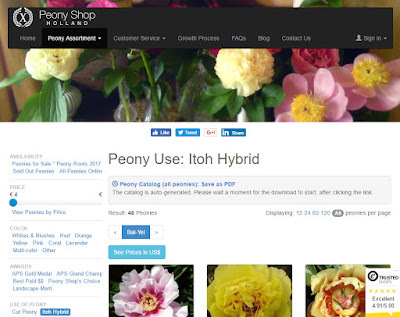 As I was putting together the 2017 Intersectional Peony Catalog Price Comparison List this year, I couldn't help but notice that Peony Shop Holland is offering 13 Intersectional Peony Varieties for less than $20 each! I have never ordered from them before, but I am definitely tempted. There is a €100.00 fee for a phytosanitary certificate, plus shipping. However, if you are placing a big order from them, the much, much lower price of the roots would likely more than pay for the extra fee. Also the dollar and the euro are almost equal now. One dollar equals .95 euro. I sent a note of inquiry to Peony Shop Holland, and Joshua informed me of another option for private collectors. There is a person in the USA who conglomerates USA orders into one shipment, making the shipping about $5 per root to your door with no separate phytosanitary charge. This might be another option to get some pretty intersectional peonies to your door! Do you know who the iteration is who conglomerates orders? I have a particular variety I'm looking for, but the out to doubles the price of the order! Her name is Karen, and I will try to email you her email address so that you can try to get your order in. She said this year's order is closing in 4 weeks.